Thanks to games like Heavy Rain, Guillaume de Fondaumiere believes fewer people buy into "videogames are murder simulators" arguments. As gamers, most of us are familiar with the rather ungenerous portrayals of our chosen hobby. Despite a lack of evidence that videogames even cause violence, there's still a strong stereotype that gamers are raised on a diet of murder simulators and pent-up aggression. Even worse, it's hard to feel like the general public has our backs, but Quantic Dream's Guillaume de Fondaumiere is actually optimistic on that score. He suspects that despite the constant barrage of negative gaming stereotypes out there, most people recognize that such depictions are actually exaggerations. "I think that things have evolved," Fondaumiere said. "I think people understand that some of the criticism that has been on gaming, the stigma that has been on gaming ... has been exaggerated." That's not to say Foundaumiere thinks the industry can rest easy just yet. He believes that developers should do more to create meaningful games that go beyond the action of popular shooters. "There needs also to be projects, or products, if I may say so, that show that we're doing something meaningful," Foundaumiere explained. "I think there are certain games that are just fun. And that's great. When I come home, sometimes I just don't want to think too much about anything ... What we're trying to do at Quantic is show that - we're not the only ones, of course - that there are a number of creators today that want to bring something more meaningful. And that's what interests us." As an example, Foundaumiere points to Heavy Rain, which encouraged Hollywood actors to take the medium more seriously. "This is really a game that had an impact in Hollywood," Fondaumiere says. "People are talking about [Heavy Rain] on good terms and saying 'this is a possible avenue now for talents to express themselves." Quantic can now expand the effect further with Beyond: Two Souls, thanks to the participation of actors like Ellen Page and Willem Dafoe. 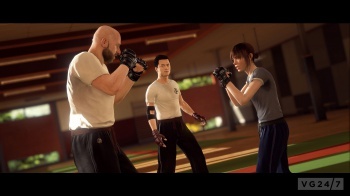 Whether Beyond: Two Souls successfully counters anti-gaming arguments or not, it's worth noting that "meaningful" games have large audiences. Heavy Rain's total sales are in the millions, while art games like Dear Esther or The Vanishing of Ethan Carter tend to generate widespread interest. Even if you don't personally find meaning in such games, the fact that they're popular at all is encouraging for an industry wanting to prove it's about more than mindless violence.